A truck driver doesn't survived in a terrible accident happened in Valenzuela city. A man was pinned to death by a log that went through his windshield and crushed his head, Monday morning. The incident went viral after a netizen Fhamii Francisco posted about it on Facebook. 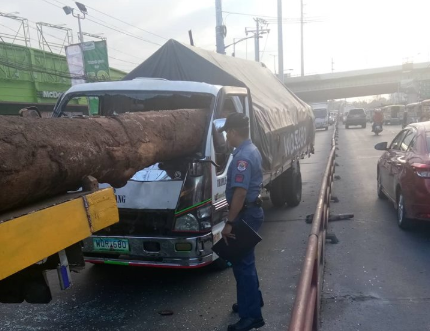 Police identified the victim as Ronald Cantado, 38, resident of Beta Street, Gagalangin, Tondo, Manila while the suspected truck with logs is Dickson Lante, 39, resident of Balaongan Street, Pantok, Meycauayan, Bulacan. The photos showing a trailer truck loaded with huge number of logs hit the man driving the Isuzu Elf. According to the report, both vehicles were traversing the highway when a red light in front of the super market appears, causing the trailer truck to stop. However, the log that was sticking out from Lante's vehicle went through Cantado's windshield and pinned him to death. The trailer truck driver is now under the custody of Valenzuela police.